Plant type: An ornamental landscape fern, native throughout the world in tropical to temperate regions including South/Central/North America, Europe, Asia and Africa. Light: Semi-shade to full shade with preference to bright indirect light or dappled sunlit areas. Dislikes full sun though! Propagation: Easily by dividing its underground rhizome. Firstly, trim off to almost ground level most of the older rachis and remove withered fronds. Then dig it up and divide by cutting through with a garden spade or sharp long-edged knife and finally replant the divisions into individual pots, being careful not to plant their crown below soil level, as it is from this point that new fronds will emerge. 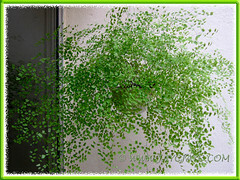 Maidenhair fern can also be propagated from spores. Collect the ripe spores from under spore-bearing pinnules (leaflets) and sow on the surface of a humus-rich sterilized soil. 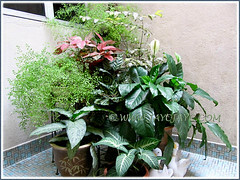 Keep the growing medium always moist by covering with a plastic bag over the pot. Germination should take place within 6 weeks at a temperature of 68-70 degrees, then transplant the tiny clumps of plantlets where desired. 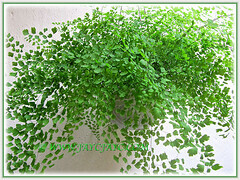 Features: Southern Maidenhair Fern is a slow-growing evergreen perennial fern that reaches 30-70 cm. tall and as wide. A very delicate looking fern that grows from underground rhizomes. It has long and wiry arching stalks (rachis) that is dark brown or black with a smooth and polished look. Its clustered 10-60 cm long fronds (leaves) which can be erect or spreading carry bright apple-green fan-shaped leaflets (pinnae or pinnules). These tiny leaflets measuring 5-15 mm wide with slightly scalloped outer edges are so numerous and finely textured that they present a lovely lacy appearance! The sori (clusters of spore-bearing organs) are found under the recurved margin of the leaflets. 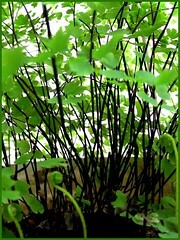 Care: Adiantum capillus-veneris is low maintenance, needing very little attention. Much depends on where it’s situated and moisture received. 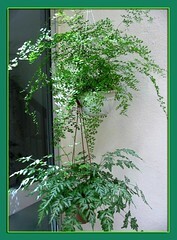 For best growth, locate these ferns where it can receive indirect sunlight or bright light, warmth and humidity. Do not neglect daily watering to keep soil always moist as drying will destroy most of its fronds. Should this happen, just trim off the dried ones to ground level, place it at a shady spot and new fronds will emerge with regular watering. Fertilize once monthly during the growing season. Remove dead stems to keep it tidy and repot once yearly to revitalize soil and increase growth rate. Keep an eye out for pests like aphid, scale or mealybugs. Usage: This Venus Hairfern is not only excellent for containers, hanging baskets or terrariums placed indoors or at patios, but a wonderful feature in hanging baskets on trellis too. It is ideal as an ornamental landscape fern for woodland garden or any shade gardens, besides being used as an outdoor groundcover plant beside a pond or rock garden with water fountain. Can also be used as a filler foliage in floral arrangements. Recently came to know by reading from the Raintree Website that this fern has therapeutic benefits too – as a diuretic, expectorant for respiratory problems, treatment for dandruff, hair loss and menstrual disorders among others. Lots of non-flowering green plants are grown in our garden primarily for their fabulous foliage and ferns are highly ranked in our list! In fact, Southern Maidenhair Fern is one of my favorite foliage plant as I find it so wonderfully fuss-free and yet, so delicately beautiful and charming with least help from us! 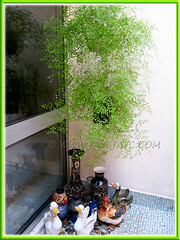 It fits easily in any bright corner indoors in hanging baskets or outdoors in any container. And I love that it can be easily propagated by division of its rhizome to multiply its lovely presence in our little paradise or distribute as gifts to neighbours and friends. Another spectacular fern grown in our garden is the Pteris ensiformis cv. Evergemiensis or Silver Lace Fern (the bottom pot as seen in the image above), a stunning variegated beauty! 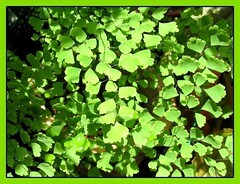 Yet another as delightful is the Adiantum latifolium or Broadleaf Maidenhair with its attractive and luxuriant green foliage. Another updated capture of Southern Maidenhair Fern on March 19, 2015. Thank you very much for a lovely, informative reading. I adore Venus Hairfern (and all ferns in general) and was happy to find your piece. Thanks to you too, Violeta for taking the trouble to pen your appreciation and thoughts. It always lightens my heart and put a smile on my face when visitors to our site find its contents helpful and give us feedback. You and your husband have an awesome garden. I thoroughly enjoyed looking through all your beautiful plants and learning about them in greater depth. I secretly wish I have such beautiful sights to admire, such as your treasured ‘secret garden’.. Thank you for sharing your passion. God’s blessings to you too, Eileen! Im glad i looked at your link. Yesterday i bought this fern without knowing its name. 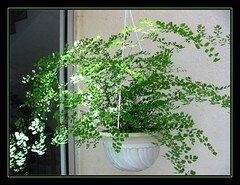 And I liked it so much that i wanted to know more and there you go…Maidenhair fern. I never knew it will have so much of theraputical qualities and its not only beautiful , wise too. like this information i got by work hard. thank you for giving such beautiful information. 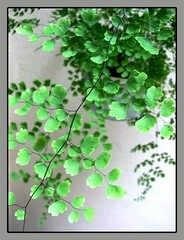 i m so much interested in adiantum lunulatum. i m doing work on this only. so this information is so much beneficial to me. You’re most welcome, mayur! Glad that you’ve found the info useful. has anyone put these in a vivarium with a high humidity and a temp at 25 Celsius ?? Even though this fern is described on the web as a Southern Maidenhair[ also Venus Maidenhair], I have discovered a mature patch of it in a small section of woods here in southeast Michigan. Don’t know the distribution rate for this fern in Michigan, but it transplants well and I am happy to extend it’s range to my garden. A delicate and elegant fern that deserves every gardener’s attention.